for control and safety. Contact us to find out why. Sign up for a 4, 6 or 8 session, class credit package. Then select the classes you’d like to take. Does the thought of taking your dog for a walk stress you out? Does your dog’s barking and lunging at other dogs cause embarrassment? Are you ready to take quiet walks again with your best friend? Don’t fear, help is here! Our Reactive Rover: Foundations class takes place in the climate controlled comfort of our center’s training space. 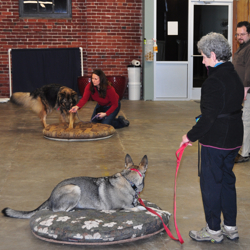 This class is all on-leash, and focuses on building calm with dogs at a distance. All of our classes are kept supportive and safe, to help you learn skills and strategies to make walks more peaceful again. You’ve taken our Foundations class to help you to gain greater confidence with having your dog around other dogs. Now it’s time to keep building reactivity skills and obedience around other dogs. Class focuses on the skills learned in Reactive Rover: Foundations and adds news skills. Each week is a different topic and focus. This class is a punchcard style class. Once you buy a package, you can choose to come every week, or just when your schedule allows. Packages are offered as 4, 6 or 8 class packages. This class is helpful if you don’t quite feel ready for Brains and Brawn or you are planning on taking our Reactive Rover: Open Air classes. For full information about our pre-screening process and class policies, please visit our class policy page. For commonly questions we are asked about class, visit our class FAQs page.